Posted on 2, February 2016 by EuropaWire PR Editors | This entry was posted in Automotive, Germany, Industrial and tagged ACCUMOTIVE, battery storage facility, Daimler, Stadtwerke Hannover AG. Bookmark the permalink. Hanover/Stuttgart, 02-Feb-2016 — /EuropaWire/ — Cooperation partners Daimler AG with its wholly owned subsidiary ACCUMOTIVE and enercity (Stadtwerke Hannover AG) will start work on the construction of a new battery storage facility this year. What makes it particularly special is the fact that this is a spare parts storage facility for electromotive battery systems. 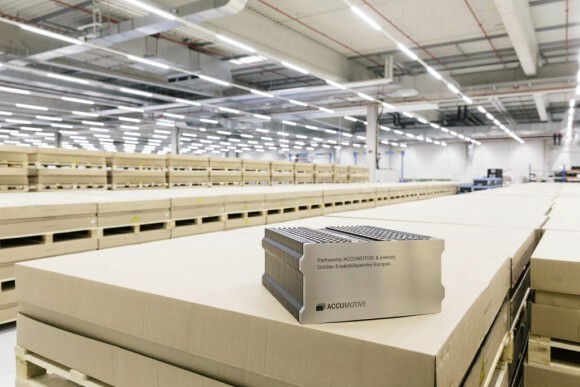 Around 3000 of the battery modules, determined for the current smart electric drive vehicle fleet, are being pooled to create a stationary storage facility at the enercity site in Herrenhausen. With a storage capacity totalling 15 MWh, the installation is one of the largest in Europe. After completion, the energy storage facility will be marketed on the German primary balancing energy market. The storage facility is already the third major project for Daimler AG in this business sector.